The Coin that Forced Congress to Act! Struck in 90% silver, the Arkansas Commemorative Half Dollar was meant to celebrate the 100th anniversary of Arkansas statehood. But thanks to it being issued for five years by three different mints along with a stream of variations specifically aimed at collectors, it proved to be something of a problem. So, when prices for the re-issues kept escalating, Congress finally pulled the plug on re-releasing early commemorative issues. Fed up with the shenanigans, Congress passed a law on August 5, 1939 terminating the re-issue of all previously-authorized commemoratives. Now you can add this beautiful – and controversial – coin to you collection. 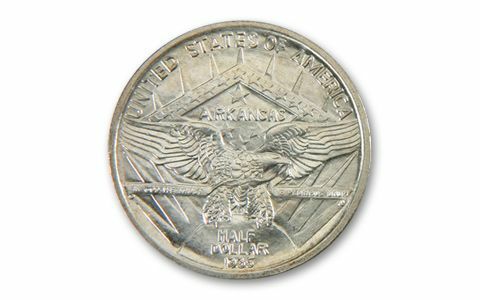 Today, the Arkansas Centennial Silver Half-Dollar is one of the most popular commemoratives ever struck. Here’s your chance to get the first-year 1935 coin struck at the Philadelphia Mint in Brilliant Uncirculated (BU) condition. POPULAR COMMEMORATIVE DESIGN – The double bust design of a Native American chief behind that of a modern-looking Lady Liberty wearing a Phrygian cap in the foreground proved popular with collectors. In fact, the coin was so popular that it was struck from 1935-1939 with the same design. The only difference was the year dates. While the obverse featured the 1836 and 1936 centennial dates, the coin’s reverse had the year of issue engraved below a realistic-looking American Eagle. 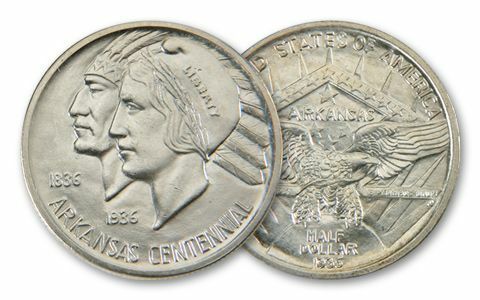 STRUCK IN FINE SILVER – These 1935 Arkansas Centennial Silver Half-Dollars were struck in 12.5 grams of 90% silver. 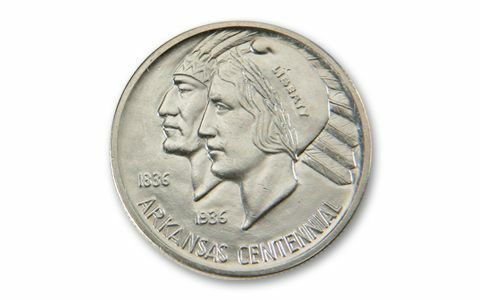 UNITED STATES LEGAL TENDER – Each 1935 Arkansas Centennial Silver Half-Dollar was 50 cents legal tender. BEAUTIFUL BRILLIANT UNCIRCULATED CONDITION – Your 1935 Arkansas Centennial Silver Half-Dollar comes in beautiful Brilliant Uncirculated condition, condition, exactly as it left the mint more than 80 years ago! LOW LIMITED EDITION – The Philadelphia Mint struck just 13,012 of these beautiful coins in 1935.